Sometimes the simplest flexible connector idea is the most effective. And, no flexible connector design is simpler, more effective or easier to use than the sleeve-within-a-sleeve. This two-layer connector features a seamless inner sleeve which is joined to an outer sleeve at the top end. The bottom end of the inner sleeve hangs inside the inlet of the equipment being filled. This directs all product flow into the pipe thereby eliminating product build-up around the pipe. The outer sleeve clamps to the equipment pipes for a dust-free connection. Simple, effective, durable and customized to your specific requirements. 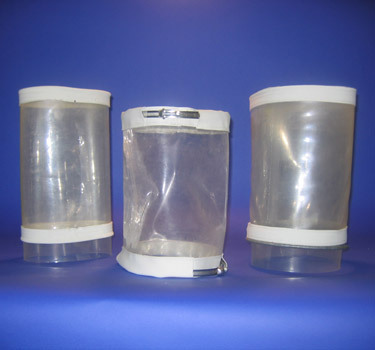 Siftex Sleeve-within-a-Sleeve™ connectors provide better dust control, easy installation, longer life and are more cost-effective! 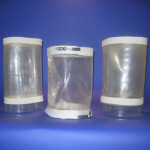 Traditional flexible sleeves may allow product to become trapped between the inside of the sleeve and the outside of the pipe. 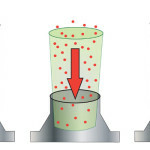 Hose clamps at the sleeve bottom and steady product build up may combine to cut the sleeve material causing leaks and premature sleeve failure. The result is more dust, lost product, more housekeeping and replacement sleeve expense. 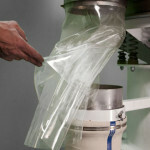 Our sleeve-within-a-sleeve design eliminates product buildup. It combines an outer dust-control sleeve with a free-end inner sleeve to keep powder, pellets and other loose materials flowing. The inner sleeve extends a few inches into the inside of the spouting. Only the inner sleeve is in contact with the product. 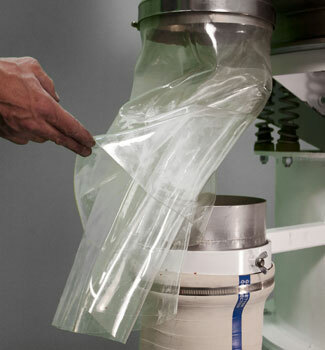 The outer sleeve is clamped top and bottom for dust-free seal. No leaks, longer sleeve life!